← Artwork highlights a People’s History in Grand Rapids – Print #3 – People First! 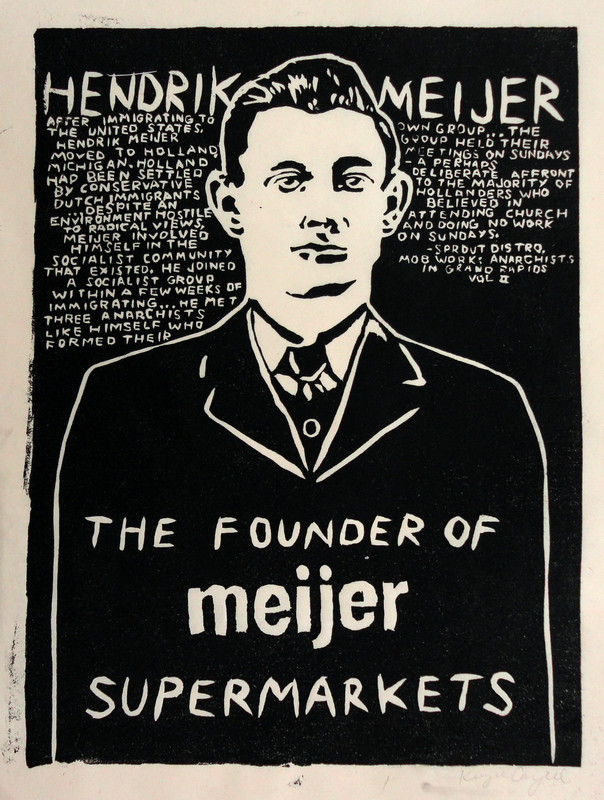 Despite an environment hostile to radical views, Meijer involved himself in the socialist community that existed. He joined a socialist group within a few weeks of immigrating. Through that group, he met three anarchists like himself who formed their own group and set to work producing anarchist pamphlets. Despite its conservative nature, their group regularly had as many as 12-15 people in attendance and socialist speakers often passed through Holland. The group held its meetings on Sundays—a perhaps deliberate affront to the majority of Hollanders who believed in attending church and doing no work on Sundays. The group may have been called the “Modern Sons of Marx” although his biographer is unsure. During this period he also organized a memorial in Holland on the Haymarket anniversary and tried to get involved with a socialist newspaper. Letters from him describing the Dutch immigrant experience in West Michigan were also published in Recht door Zee, a Dutch anarchist newspaper. When Hendrik Meijer’s partner Gezina Mantel finally came to the U.S., the couple specifically chose to get married on November 11, 1912—the anniversary of the executions of the Haymarket anarchists. This narrative of Meijer is not widely known and for good reason. The Meijer family, who are some of the wealthiest in the state, would not want the fact that their grandfather embraced for a time, both socialism and anarchism. To read the entire zine from Sprout Distro, click here. This entry was posted in Anti-Capitalism/Labor, People's History Artwork and tagged Haymarket Anniversary, Hendrik Meijer and Anarchism. Bookmark the permalink.